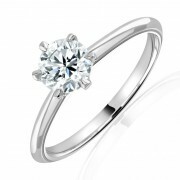 Diamond Solitaire Rings	There are 77 products. Diamond solitaire engagement rings selected by our award winning FGA gemmologists and hand mounted in classic or contemporary settings in platinum white and yellow gold. This is the start of something special. Many more styles and loose stones available to view in store or design your own with our state of the art design service. This unusual ring would make a fabulous addition to any jewellery collection. Made form 18ct white gold and round and pear cut diamonds this stunning piece is sure to turn heads. Macintyres, a family business with global values. Award winning gemmologist Stephen Turner and diamond specialist Gaynor Turner share a vision to provide high quality but affordable precious jewellery. With an emphasis on staff education, an aversion to compromise and meticulous attention to detail they created Macintyres and have grown it over the past 21 years to become the largest jewellery showroom in Scotland . This website is a tiny taste of the vast array of beautiful quality jewellery that Macintyres offers. Enjoy! Sign up to receive our latest news and offers. Macintyres of Edinburgh is a limited company registered in Scotland. Company registration No. SC143354. © 2019 Macintyres of Edinburgh Ltd. All rights reserved.